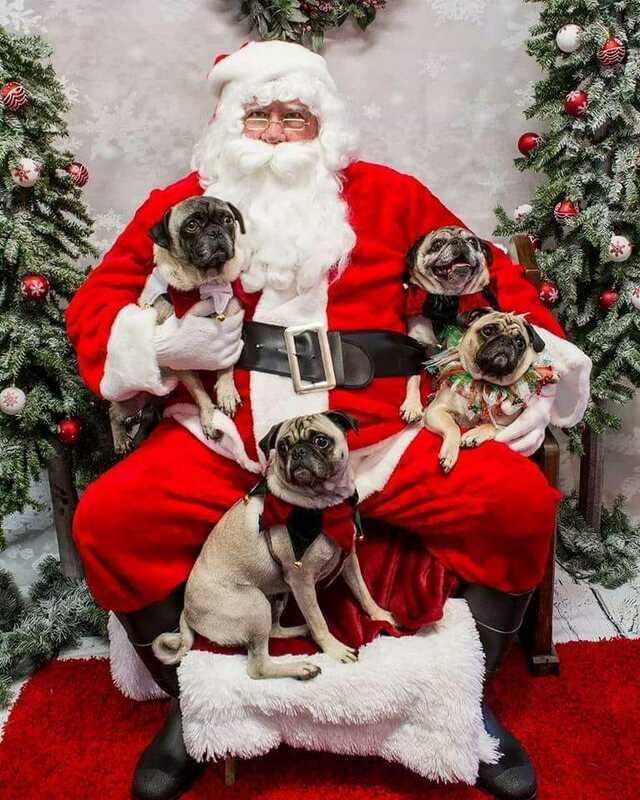 The PugHearts Christmas Party and Santa Photos are all set at Gimmie a Bark in Friendswood on Sunday 12/2/18 from 12pm to 4pm. This is a must attend event as there will be a festive atmosphere and Santa Photos for the pups going on! A big thank you to Wendy Franty and Bill Morgan who will once again be volunteering their time to make the Santa photos a success!!! The cost of Santa photos will be $10 for a single dog or $15 for multiple dogs (please pay with cash or check). Photos will be posted within a week so everyone can show them off on their Christmas cards! This is also an adoption event, so come out and meet our fosters that would just love to have a forever home for the holidays! If you have not been to the new Gimmie a Bark, you will not be disappointed! PugHearts and our pugs will be staying cool in the AC at the adoption event on 8/4/2018 at Rover Oaks (Central Location) from 5pm to 8pm (arrive at 4:30pm if you are helping with set up). This is an indoor event with a large space for lots of foster dogs! Wendy Franty will also be there with a summer inspired photo booth! Active fosters can get professional grade photos for free. Everyone else can get take advantage of this fantastic photo op for only a $10 cash donation to PugHearts! The photo booth will run from 5pm to 8pm during the adoption event. Thank you Wendy for setting all this up!!! If you are bringing a personal dog, please be sure to have proof of a current influenza (both strains) shot done at least 72 hours before arrival. We have a good one for you this time! Gimmie a Bark in Friendswood will be hosting a Cinco de Mayo themed adoption event complete with pug races to benefit PugHearts! Bring some cash and your fastest pug! Gimmie a Bark will generously be providing snacks and refreshments. This event will take place on 5/5/18 from 10am to 2pm. IMPORTANT NOTE ABOUT PARKING-There will be a farmers market going on at the park across from Gimmie a Bark and the usual parking lot will fill up early. There is overflow parking on the opposite side of the park from the store and down Shadwell (the street with the usual parking spots). PugHearts will be having a GOLD PARTY at Rover Oaks at 2550 W Bellfort St, Houston, TX 77054 on Saturday 8/16/14 from 5pm till 8pm. YOU CAN MAKE MONEY AND PUGHEARTS WILL ALSO GET A DONATION! This is also an adoption event and dogs are welcome to attend. Thank you to Rover Oaks for allowing us to use their facility for this event! Bring your Jewelry Box, Get an Offer, You Decide! 1. You keep 100% of your payout & a portion of the proceeds from the items purchased will automatically be donated back! 3. Bring Everything! Their certified, licensed buyer will tell you what is real or not. 5. Bring Friends! We can donate an additional $150 with at least 10 sellers and a $2000 party! Featured on FOX News for having the highest payouts! Sustain Juicery has just opened a location in West University and is run by PugHearts' own Wen and Astrid!!! They are graciously donating 10% of any sales when you mention PugHearts during the month of August and to kick it off PugHearts will have a small adoption event at Sustain on Saturday 8/2/14 from 1pm to 3pm. Sustain Juicery has tons of made to order COLD PRESSED juices and smoothies. They also offer juice cleanses. They strive for locally and/or organically grown ingredients. If you are a long time juicer or just getting into it, you should check them out - and mention PugHearts! The adoption even on 8/2/14 will run from 1pm to 3pm and will be indoors, but there is limited space, so please leave personal dogs at home (unless you have a meet and greet scheduled).